A dry mix product that when mixed with water produces a rich and creamy French Vanilla flavored Cappuccino. For best results, mix in a commercial blender with ice. Sucrose, Corn Syrup Solids, Coconut Oil, Instant Coffee, Sodium Caseinate (a milk derivative), Potassium & Sodium Phosphates, Natural & Artificial Flavors, Mono & Diglycerides, Salt, Soy Lecithin. Blender Directions: Place 1/3 cup water or milk, 1/2 cup (72g) of Frostline® Cappuccino Mix and 3/4 cup ice cubes into a blender container with good ice crushing ability. Blend according to manufacturer’s instructions for smoothies, generally 30 seconds. 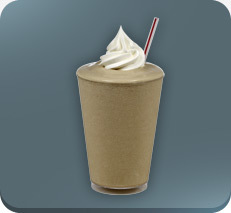 Smoothie should be smooth and thick with no detectable ice crystals. Yield: 1 - 8 fl oz smoothie Granita Machine Directions: Fill a clean sanitized container with one gallon of cold water. Pour in two - 2 lb. bags of Frostline® Cappuccino Mix and stir with a wire whip until completely dissolved. Pour immediately into granita machine or cover and refrigerate*. Yield: 26 - 8 fl oz smoothies *FDA requires product temperature to reduce to 41°F within 4 hours.